Jack Paris and some of the Martian Killers land at a Jersey airbase he used to fly out of after successfully driving off a group of Alien Saucers attempting to get at New York. He thinks of Josie Taylor, fellow MK agent and his on-again, off-again lover. Behind him stands a modified B-17, the new MK Tank/Walker and an XP-51 Mustang, augmented with ‘Martian’ Tech. Some of the Allied planes do a victory fly-over. 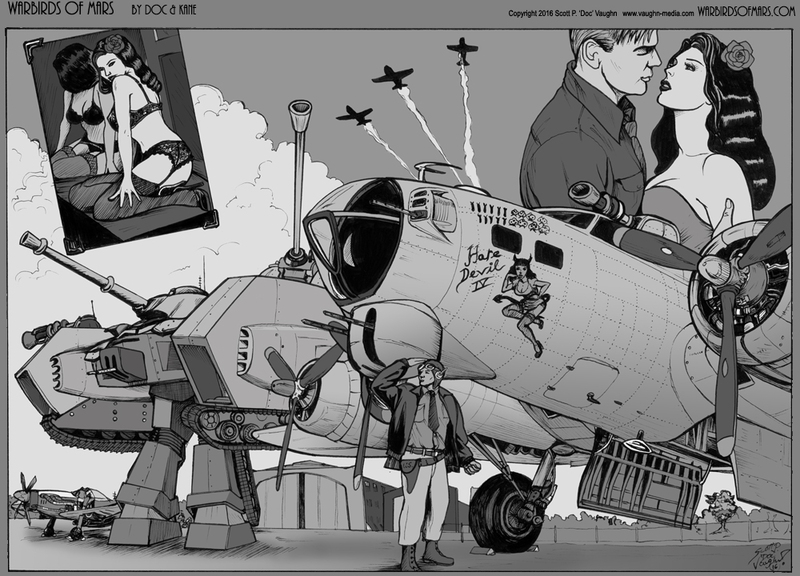 My Patreon subscribers got to see this a few days early before it debuted at http://warbirdsofmars.com and my $5+ subscribers get to download a hi-rez file of this. Posted on February 26, 2016 at 4:01 am in WARBIRDS OF MARS 1. Follow responses to this post with the comments feed.